Luther was primarily a preacher, and he followed the precept that ‘Christ Himself wrote nothing, nor did He give command to write, but to preach orally.’ He was forever delivering sermons, calculated at preaching some 7000 between 1510 and 1546; almost 200 per year, or four a week. 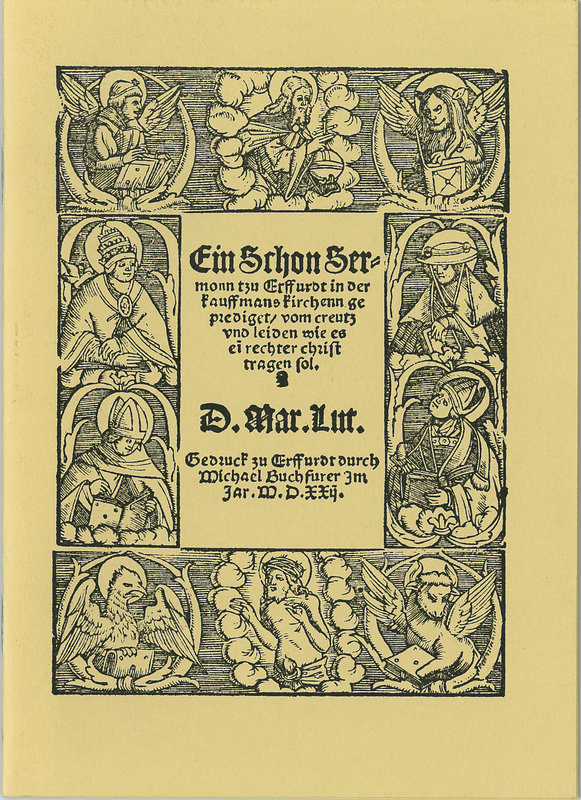 Luther’s Sermon on Indulgences and Grace (Eynn Sermon von dem Ablasz und Gnade) was printed in April 1518. Written in German, it was a best-seller. Reprinted 14 times in 1518 alone, its success established the reputation of Luther. On 22 October 1522, Luther was at the Kaufmannskirche, one of the oldest parish churches in Erfurt. He delivered a sermon on the suffering of a Christian man. This is a facsimile of that sermon. Martin Luther, “Ein Schon Sermonn tzu Erffurdt geprediget,” ourheritage.ac.nz | OUR Heritage, accessed April 26, 2019, http://ourheritage.ac.nz/items/show/10340.